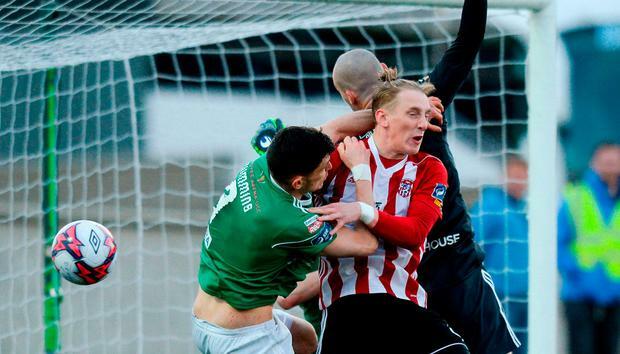 Derry City and Cork City played out a frantic and fascinating draw at the Brandywell. There was a fast start to the game from Derry, who forced two corners in the first three minutes, the last of which saw Nicky Low’s near-post delivery met by Ronan Curtis, whose bullet header flew just wide of Mark McNulty’s post. Just before half-time Rory Patterson had a great chance, one he really should have taken. Jack Doyle broke down the left and his low cross was on the money but Patterson got his feet all wrong and the effort failed to test McNulty. Cork had a great chance to win it with just nine minutes remaining when Conor McDermott attempted to shepherd the ball out of play for a goal kick, but he was dispossessed by substitute Kieran Sadlier, who turned inside and drove a shot at the near post which was kept out by Gerard Doherty. Three minutes of added time had the City fans on their feet and Low came so, so close to becoming the City hero as he drilled an effort which just deflected wide of McNulty’s goal. From the resulting corner Aaron McEneff’s curling effort eluded everyone, but he hit the inside of the post and went back into the McNulty’s hands. In a frantic finale Steven Beattie’s effort was spilled by Doherty but McLoughlin somehow couldn’t put the ball and Derry scrambled it clear. DERRY CITY – G Doherty, C McDermott (J McDonagh 88), D Cole, E Toal, J Doyle, A McEneff, N Low, R Hale, R Curtis, R Patterson (N Boyle 83), R Hale. CORK CITY – M McNulty, A Bennett, J Keohane, C McCormack, G Cummins (J O’Hanlon 71’), K Sheppard (S Beattie 79’), S Griffin, C Horgan, B McNamee (K Sadlier 61’), G Buckley, S McLoughlin.